For use with the H3639 plans for the logging truck. This kit provides the smaller pieces and details to enhance your model-building experience and help you create a treasure to enjoy for years to come. Please note this does not include all the parts needed to make this model; these are only detail pieces to use in addition to your own materials. 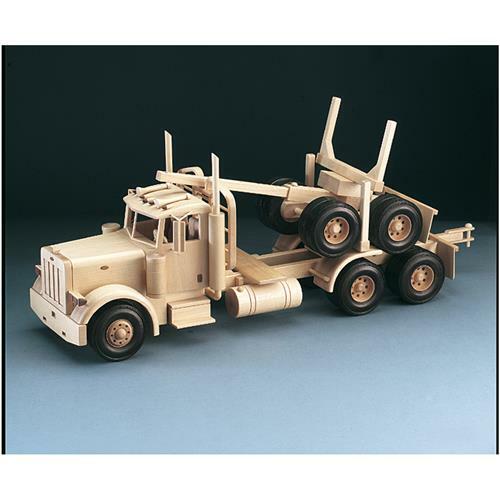 Logging truck detail kit includes: truck wheels (18); wheels 1-1/4" dia (2); axle pegs (8); airhorns (2); axle caps (4); wooden buttons 3/8" (6); wooden buttons 1/4" (6); dowels 1-1/2" x 6" (2); dowel 7/8" x 12" (1); dowel 3/4" x 12" (1); dowel 3/8" x 12" (1); dowels 5/16" x 12" (3); dowels 3/16" x 12" (3); dowel 1/4" x 12" (1); dowels 1/8" x 12" (2); and dowels 3/32" x 12" (2).